October 2015 – Anne. 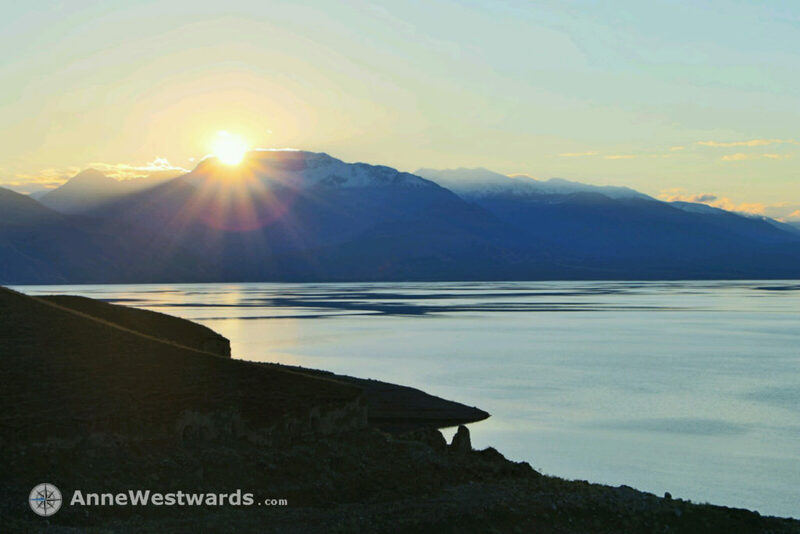 Westwards. Wrapping up those first two weeks is a tough job. My fear at the beginning was justified and not. A very boring, rainy first day got me to Kara Balta, a small city with a remarkably run-down gastinitza (hotel) from Soviet times, but also with a (similarly run down, but wonderfully hot) banya next door. A banya is a Russian style sauna, featuring not only hot water (hot AND water, both really precious), but also a hot surrounding for washing yourself. The last weeks have seen me become addicted to them = there is nothing quite like the smell of hot water in a metal container! Sometimes, I just stick my head inside the bucket and enjoy this particular smell… Some homestays have those same banyas, in a tinier version, but essentially my version of heaven. It gets you clean after days upon days on the road without washing. AND it gets you warm. PLUS, you can usually use the remaining hot water to wash your cycling clothes (the smell of which is pretty impressive after having cycled in them for a week or so). The dead cockroaches on the walls were not quite my version of heaven, so I was happy to leave Kara Balta behind to cycle into the mountains. 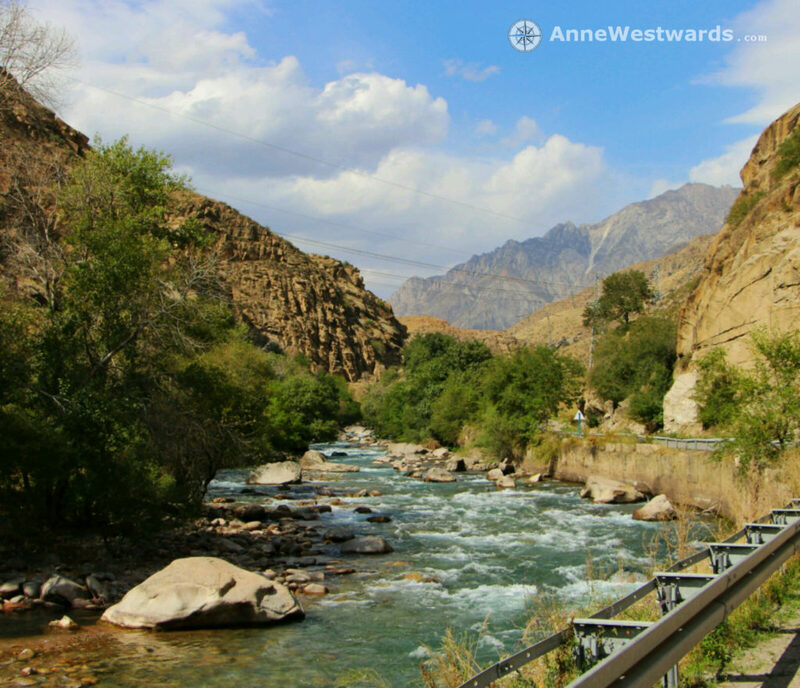 My stretch from Bishkek to Osh was a trial run of sorts. Other people take trial tours, shorter trips where they test their gear and see if long distance is actually something they might enjoy. 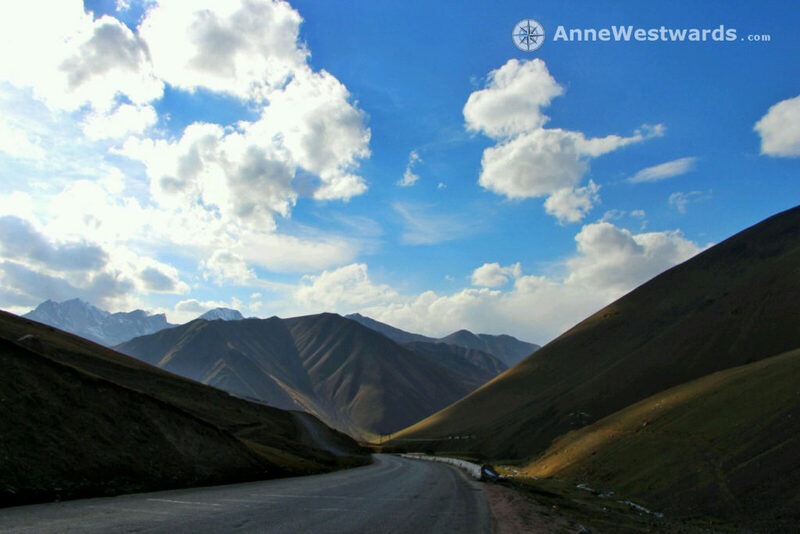 For me, those first two weeks in Kyrgyzstan were my trial tour. Already quite remote with stretches when I would not pass a town or village for an entire day, there were still people around every now and then to whom I could turn for help if I needed it. 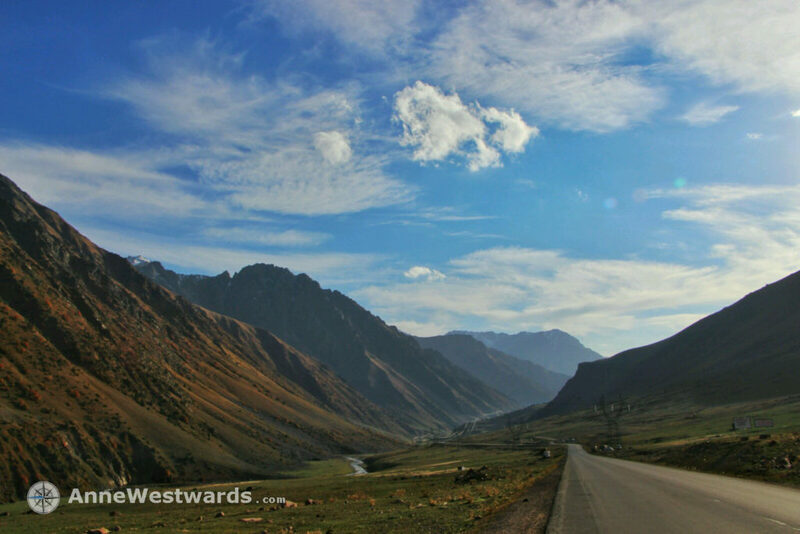 The route took me from Bishkek via Kara Balta up into the mountains to the Tor Ashuu pass. 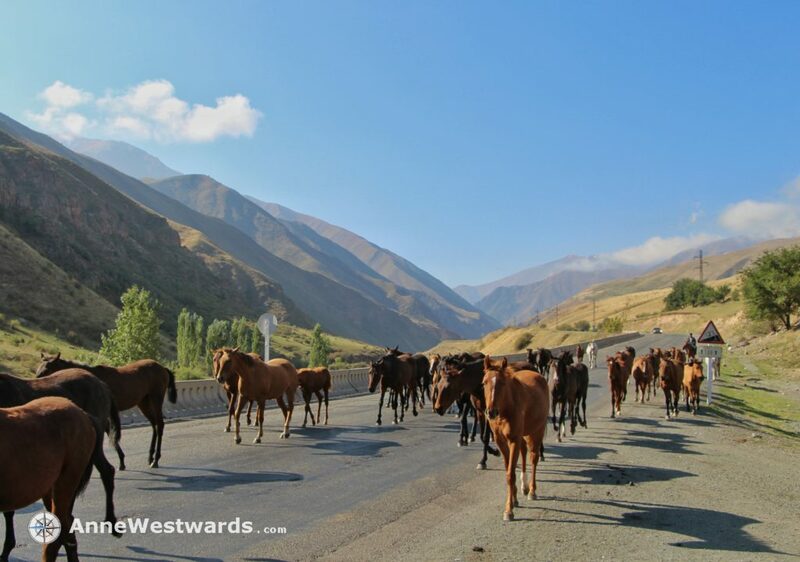 From there, the road ascends into the wonderful Suusamyr valley – warm herding space for the nomads whose yurts dot the valley ground, surrounded by treeless mountains. Ala Bel, an easy pass at the junction to Kazachstan, brought me into the rocky red sandstone canyon of Chichkanon that leads to the Toktogul reservoir. The hills around the reservoir are psychologically taxing – no passes, no mountain road, but still a quite substantial up and down that wears you out. Even though it had been just few days in the middle of nowhere, I was absolutely fascinated to cycle through villages again – tiny shops, cars, people, houses! Toktogul reservoir is really huge, so it took some time to get to the other side. I spent a wonderful evening there camping with four other cyclists (who went the other direction) at a perfect camp spot next to a lonely house. 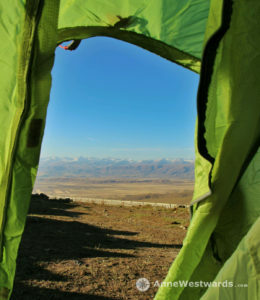 Camping with great company and this view of Toktogul – how much better can it get? The views of the lake were quite stunning – and our early morning bath in the lake as well! 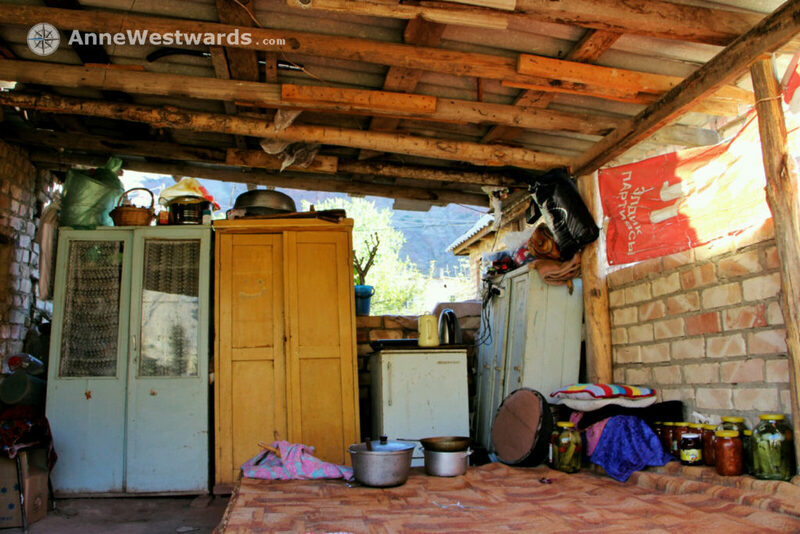 The following food poisoning I could have done without… I still made it over the next pass into the charming little village of Karakoel, where I was taken in by a lovely family before my body broke down. 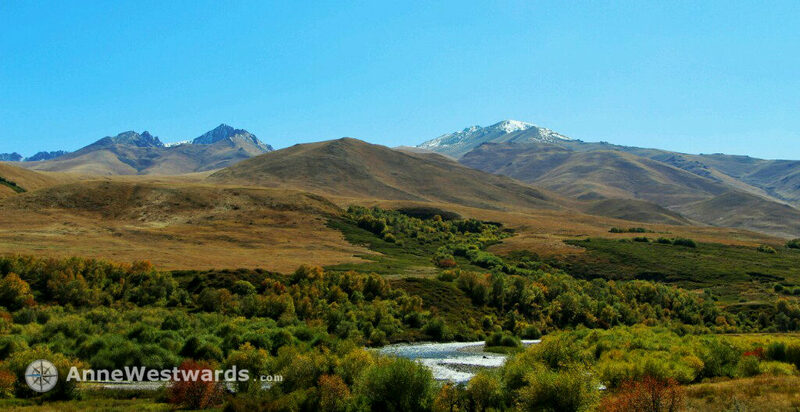 Once I could stand up again two days later, I hitchhiked to Osh, skipping the heavily trafficked Fergana valley. So much about the route as such. What happened in between? 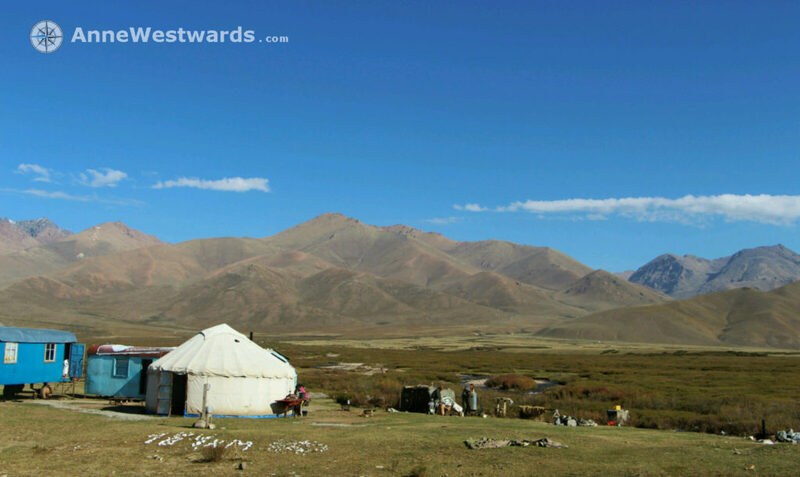 My first night alone in the tent, in the middle of nowhere… I would likely have slept better, had I not met a local Kyrgyz before who was very worried about me camping in the gorge, as the wolves would come down from the mountains at night. 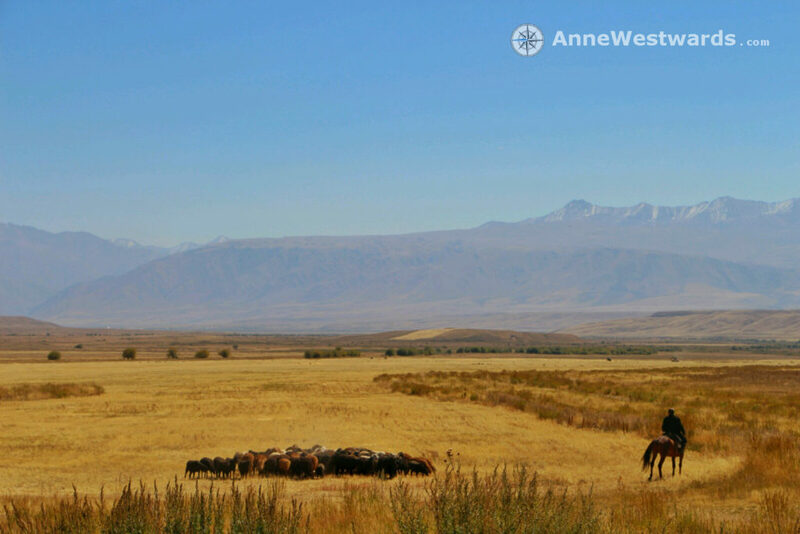 Not the best story for falling asleep… Wolves were haunting me all the way from Bishkek to Osh. That first night, I could hear them from afar. The next night, I had one nosing around my tent. At least, that is what I believe, as the dogs from the yurt close-by went crazy about the animal that was obviously interested in my tent. In hindsight, your bodily reaction to hearing wolves around you at night is absolutely fascinating. This is the pure essence of fear. Instinctive. It might have been the first time for me to understand what it means to have your blood freeze. None of what I have experienced in my life so far that I called “fear” compares to that. These are all cheap knock-offs to that instinctive, primal fear. It feels as if your heart and your breath stopped. Your body tries to play dead. The upside of cycling long hours is that, despite your fear and despite the cold, you do fall asleep at some point. The cold got me for the first time right after my first pass (Tor Ashuu). 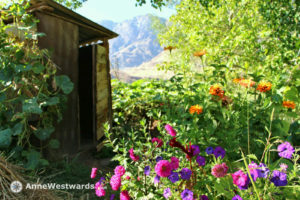 Kyrgyzstan had been nice with me during the days, sometimes reaching 20C even in the mountains. Still, I had some freezing nights, where the thermometer dropped below -5C. Somewhat of a preparation for the icy Pamirs in Tajikistan. 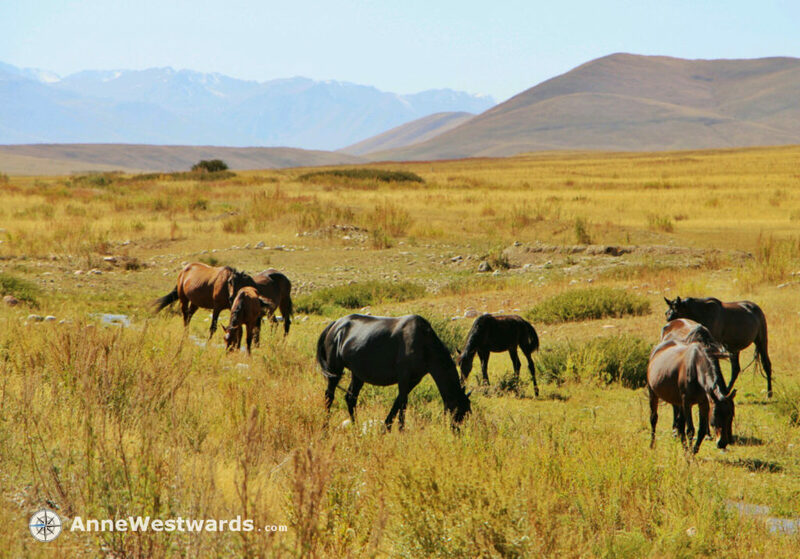 Usually, I tried to stay close to humans at night (the wolves, you know…), which oftentimes meant close to a yurt, the summer habitats of the Kyrgyz nomads, who roam the mountains with their herds of horses and sheep. Their most prized produce is Kymyz, fermented horse milk. While it tastes quite nice when it is fresh, the fermented version made my stomach want to empty itself… The Kyrgyz love this drink, however, and all visitors to high altitude terrain enthusiastically buy litres upon litres of if from the nomads, filled into empty soda bottles. 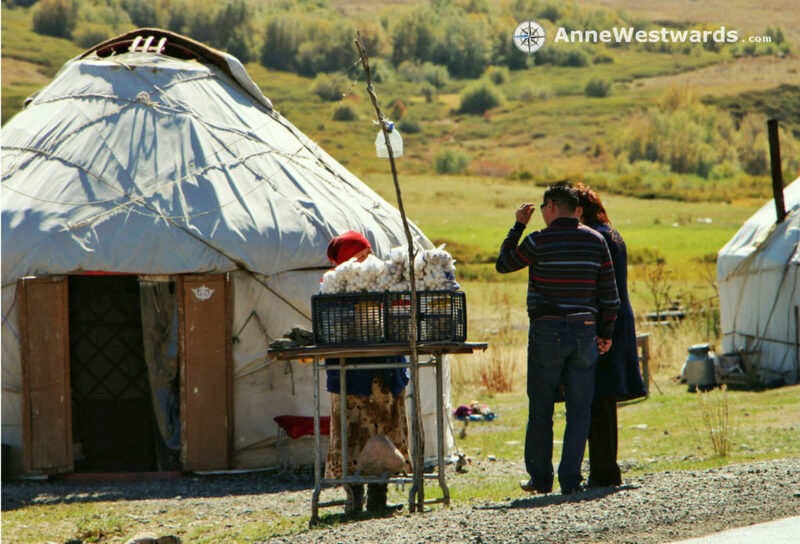 While the nomadic life may sound romantic, this is a society dominated by men. Men who tend to stick to alcohol a bit too much, a bit too often. Women don’t count much here. Domestic violence against women is not uncommon, and it seems no disgrace to beat your wife in front of the female visitor (me). I will never forget the look in the eyes of the woman who fled to me during the night as she as afraid of the beatings of her violent husband (I saw him beat her on the head, high above from horseback, with a stick, the next morning). In the dim light of my flashlight, she counted and recounted the money she had earned that day selling Kymyz. She stashed away a certain percentage in her sock, counting the days until she would have enough to run away. I added some to the money in her sock. The next morning, she played the upbeat wife again, telling her husband whenever she disagreed. Still, I could not forget her eyes at night – the eyes of an animal fleeing from a predator. I also won’t forget how she kissed me on the cheek when I gave her money, telling me that women can only count on other women. I had one instance where I was afraid for myself. After a tough day of cycling, including Ala Bel pass, I was racing down into Chichkanon valley while the sun was already setting and temperatures dropped rapidly. It was one of those times when you realize that steering a bike while your teeth are clattering is really hard. Hands almost frozen, I was desperate to find a space to camp. Only that the canyon was so narrow and steep that there seemed to be no space. 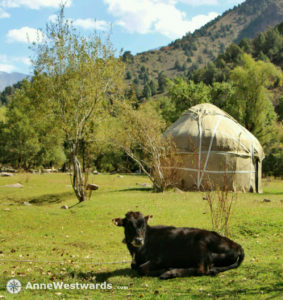 Finally, I saw a couple of yurts on pristine camp ground – flat, grassy, next to a river. Perfect! Next morning… still a perfect camping spot! A guy about my age came out and I asked if I could camp there. It did not occur to me that he might be the only person at camp. In fact, we were the two only people within the next couple of kilometers. Out of an instinctive reaction, I decided to take a yurt, as I saw that it had a wooden door that could be locked from the inside with the padlock I carry with me. A good decision. While my Russian is not great, it became very obvious what the guy was interested in. It did not help to pretend not to understand him, to make up imaginary wedding rings. He made it very clear that the night would be cold and that he wanted a woman next to him. I joined him for milking the horses (actually, quite interesting), only that this led to further sexual comments… At some point, it became simply unbearable and I left brusquely, ignoring all invitations to come to his yurt for a beer (well, I am not insane). Locking my yurt from the inside, I still felt very vulnerable and passed a night that was not all that relaxing, knowing that he would get drunk alone now (the combination of drunk and frustrated is not the best…). Nothing happened, though, and I cycled away the next morning promising myself to choose my sleeping spots wiser the next time. Or at least a bit earlier- if it is already dark, you have no choice but to stay (cycling downhill a steep canyon at night is something I fear more than having a horny, drunken guy outside of my yurt). More often, however, I experienced fantastic hospitality from random people. Asking if I could camp in the yard, I was oftentimes invited into the house, at least for dinner, but more often, a bed was prepared for me as well. Houses here are mostly devoid of furniture. Maybe a wardrobe on one side. Other than that, families here possess an impressive amount of blankets, some of which are spread on the floor for either sitting (eating from a blanket on the floor or on a slightly higher table is quite common) or for sleeping. Thus, when a visitor comes, the family simply spreads a few blankets more on the floor. 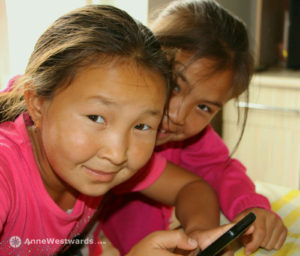 The children are usually a door-opener, as they are the ones who invite you in with broad smiles and big eyes. In return, I help them with their English homework or play with them. Once, I stayed for almost two days as it was raining cats and dogs outside – not my version of cycling heaven. Over the course of the two days, quite a few people showed up: neighbors came for tea, friends stopped by to bring water melons, the local retired German teacher paid a visit. Being in the center of attention can be exhausting (and even as a cyclist, it is quite taxing to eat that much food all the time! ), but I usually enjoyed all the interaction. And when the children bring their English books, I usually learn some more words of Russian as well (the translation is usually English-Russian). Plus, you find some amusing remnants from Soviet times (“when I grow up, I want to be a farmer on a collective farm”). The typical diet here is chai and chleb (tea and bread) all day long. The variation for breakfast may include milk in the tea (or, in official homestays, two scambled eggs on the side), lunch will have some meat as well, dinner likely some potatoes. Sometimes, a soup is added (a piece of meat or bones plus a potato is typical in there). If you are really lucky, you get manti (steamed dumplings) filled with meat. My stomach can usually handle anything down to street food in developping countries (I never had issues even in India!). But the bacteria here get everyone, it seems. I had some sort of food poisoning twice, giving me stomach cramps as I have never have them before, plus a really annoying diarrhea for a week. Not ideal for cycling, when you need to find ways to get your energy. Luckily, during the worst phases, I had been taken in by families in both cases – the first day, I was too weak to even stand up without shaking. Cycling is wonderful and exhausting at the same time. The landscapes here are fantastic, ever changing, but they do involve high passes and simply long stretches of no-man’s land. At some point, I started wondering if I ever would make it past 50km per day. I did, but on days where the road is only ascending, it can also be quite a bit less. Depending on the circumstances, I do not ask twice when it comes to hitchhiking. My first time was actually at my first pass (during my third day of cycling). After a long day of cycling only uphill for more than 1000m of altitude, I was quite tired when the clock showed 5pm. 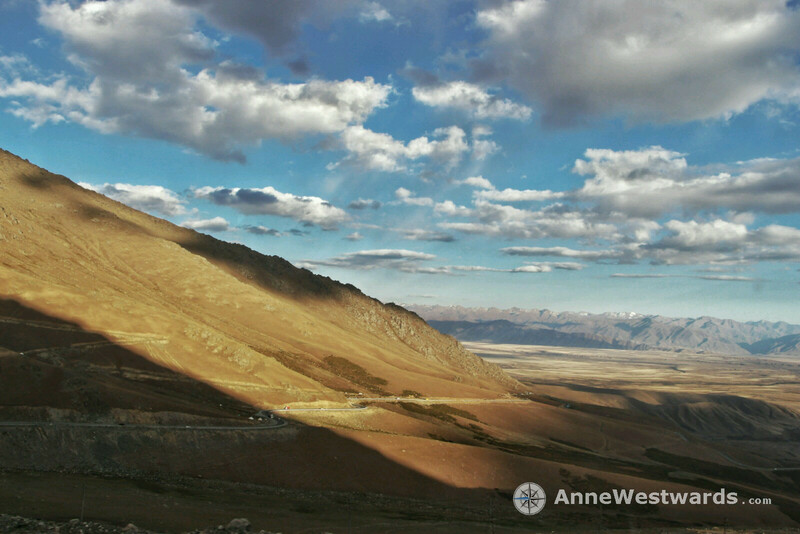 I knew that it was another 1000m of altitude to the pass – I would surely not accomplish that on the same day. However, the canyon had already gotten pretty narrow, as the street was starting to take hairpins up to the pass. No space for camping at all. Thus, I tried to push on, hoping I would find some space further up the pass. Instead, my eyesight went blank for a moment and I could feel I had nothing left in my legs. Almost blind, I stopped, turned around and stuck my thumb out. When I opened my eyes again, a truck driver made an apologetic gestures when he approached me. Damn! When he passed, I felt like the last person on earth, utterly exhausted. Then, brakes squealed. The truck driver had stopped at the next hairpin, gesturing to me that I should come up. I have rarely been that grateful! Since then, I have hitchhiked another few times, when I was physically exhausted or sick, or when I knew the stretch would have heavy traffic. The truck drivers here are incredibly nice and never accept any money. The price you pay, though, is that inevitably, something on your gear or bike will get broken. Well, so far, I could fix most things again (it also makes it feel that bringing so much repair stuff was a good idea). 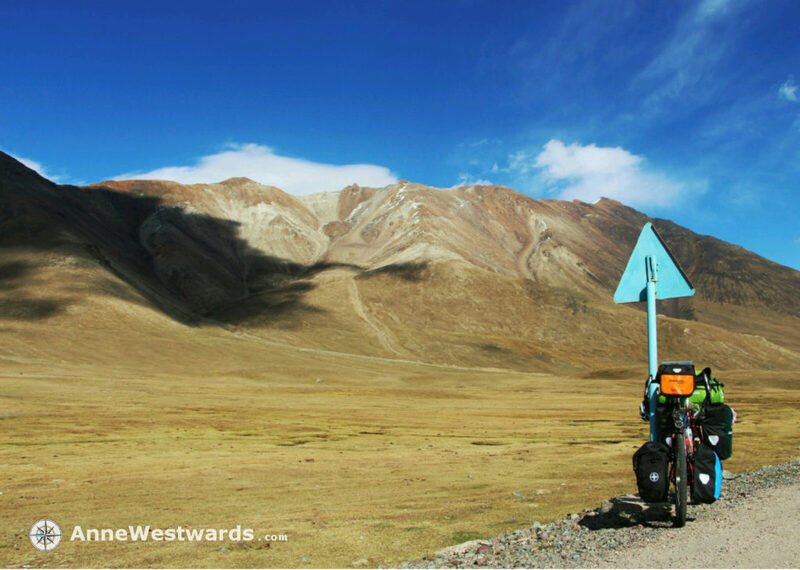 So far, I have met at least one cyclist per day – most of them have started in Europe in spring and now cycle through Kyrgyzstan before descending into China. Meeting other cyclists is always a joyful occurance. You always stop, no matter your schedule, to chat about your destinations and the road ahead. Once, I passed two cyclists when I was climbing a mountain and they were racing down. They did not stop, which creates a disappointment in you which is hard to describe. Not only is this against the unwritten code of conduct, you feel deprived, utterly deprived. Cyclists really are the best source of information when you are doing something that no guidebook covers. 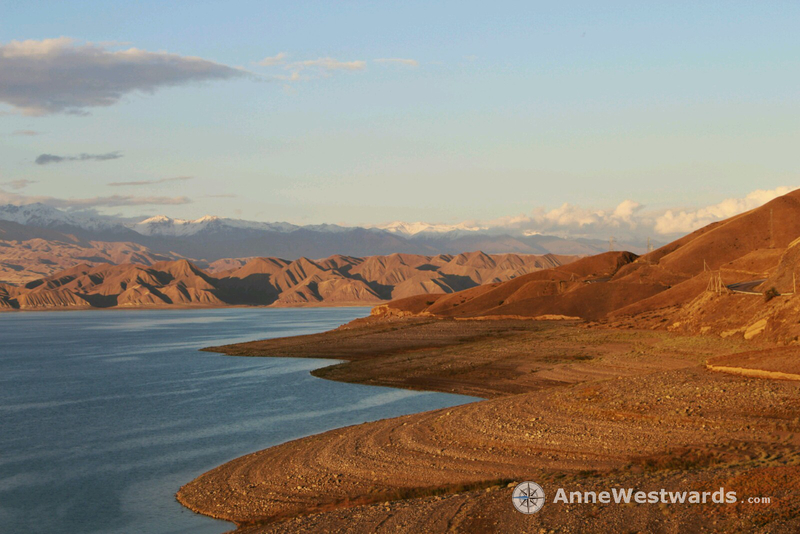 Water sources, terrain, good spots to camp – you exchange information on all of that and more. Plus, it is just nice to meet people who understand. Understand the pain, the joy, the hunger, the fascination. Everybody has their own story, some have been on the road for years already. You could easily spend days just talking, but some 10/20 min later, the road calls you again. “Safe travels!” Rarely has this had more meaning than during this trip. Cycling gives you a lot of freedom, but it also leaves you quite a bit more vulnerable. One of the important pieces of information is also, where crazy dogs await you. 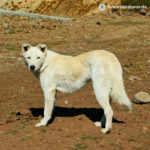 Kyrgyzstan features dogs that seem closer to wolves than what we call dog. Plus, they are semi-wild and not really trained other than in herding. When they see a cyclist from the corner of their eye, they will surely jump up and try to chase. So far, I have been spared any bites, but that was more luck than anything else… I have seen impressive holes in the the panniers of some less lucky cyclists, where to the dog did not quite make it to the calves. Sometimes, I feel way more like a cat person than a dog person.